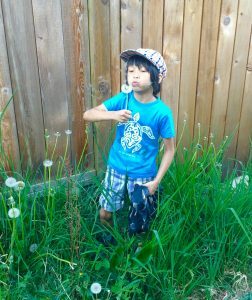 This guest post is contributed by a Kids New West Ambassador, and doesn’t necessarily reflect the views of the Kids New West Child Development Committee. Interested in becoming a volunteer Ambassador and sharing your thoughts on our blog? Check out this page for information. According to some meteorologists, we’re heading into another long, hot summer with tempestuous weather patterns. Whether those predictions turn out to be correct, no one can deny that there is growing concern about climate change including the potential for melting ice caps in the Arctic, reduced snow in winter and increased risk of drought and flood. And it’s not just the weather “experts” talking about climate change. Did you happen to catch Leonardo DiCaprio’s climate change threat speech during his golden Oscar moment? Or the fact that the new Federal Liberal government created a new ministerial title called “Minister of Environment and Climate Change”? I don’t know about you, but I found it rather depressing last summer to look at brown lawns by early July and, by August, to hear radio advertising encouraging us to shower less. If there are ways for us to leave a lighter footprint and help combat climate change, I’m all for it. Like most Canadians, you probably enjoy spending at least part of your summer playing in the great outdoors, and there are a lot of local ways to do just that that are not too expensive and may even help mitigate the effects of climate change. How about growing your own vegetables? Kids love to plant and help things grow, so whether you join a community garden, have a back yard or boulevard plot or container garden on your patio, you can grow and enjoy delicious vegetables like lettuce, tomatoes, potatoes and carrots, along with various herbs, to add some savoury sizzle to your salads and main dishes. You can even grow summer berries and really, who doesn’t want more strawberries, blue berries and raspberries on hand? At my son’s school, the Mother’s Day gifts this year were live plants. Now, I like art as much as the next person, but when Lucan presented me with that strawberry plant in his decorated clay pot, I thought that was the BEST! GIFT! EVER! I mean, you can’t eat most art. Heck, bees even like dandelions so one thing I encourage Lucan to do, just for fun, is blow the seeds off the spent dandelion flowers to encourage more to grow. I remember doing that a lot as a kid because, well, did I mention that it’s fun? This is my environmentalist spreading Bee love on Earth Day. Supporting local farmers encourages more local food production and reduces truck deliveries. Now, if you’re looking for an over night getaway, then camping is your ticket to a memorable back to nature adventure. From finding your ideal spot, to preparing meals like an old time pioneer, to camp fire songs, ghost stories and smores, to waking up to the loud sounds of nature: birdsong, bug buzz and chattering squirrels (who like to throw nuts at your tent) you can’t beat camping for a unique and colourful experience which will generate interesting stories (whether you go fishing or not) that you can embellish for years to come. The bugs were HUGE!, the rain was torrential!, the hiking trails were the steepest EVER!, the view was epic! The charred hot dogs and marshmallows were awesome, and, well…you get the idea. So, get out there, get back into nature and let’s all do our part to help turn the dog days of summer into the green days of summer. With the advent of summer comes the promise of new adventures and, for some, this includes making time to delve into a good book. One activity I suggest you consider this summer is to join a book club. As I matured, the Narnia series gave way to Nancy Drew and The Hardy Boys mysteries, perfect summer reading at the cabin. As a teen I enjoyed that book about a certain Hobbit named Bilbo Baggins, and later the “Lord of the Rings” Trilogy. Interspersed with these were Sidney Sheldon and Steven King novels. Really, is there any better reading for teenage girls then romantic mysteries and gruesome thrillers? In turn, the Sheldon and King books gave way to historical novels like those of Sharon Kay Penman, with some Bronte, Austin and Shakespeare thrown in for good measure. So many stories, and you know you have a good one when it is difficult to put the book down; and when you reach the end you have that moment of deep satisfaction that you’ve finished a remarkable story, followed by that bitter sweet realization that it’s over…and you wonder when you’ll find another really good book. So, have I convinced you to join my book club yet? It’s open to all ages and really quite easy to join. All you need is a library card. My son and I have been part of the New Westminster Library Book Club since Lucan was a baby. He started out with board books and puppets and then came books about animals. Then came Dr. Suess and Curious George stories, followed soon after with train books, always returning to, “The Best Book of Trains”, which is aptly named. Now Lucan is into books about planes, sea life, Scooby Doo mysteries, mermaids and, of course, train books. The Main Branch of the New West Library is located at 716 6th Ave ph: 604-527-4677 and there is a branch in Queensborough at 920 Ewen Ave ph: 604-636-4450. 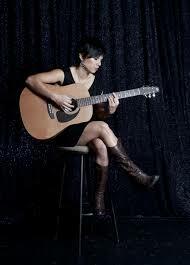 Or check it out online at www.nwpl.ca and see the various summer activities. Don’t forget to sign up for the Summer Reading Club, open to kids 3-11 years old. The kick off party is June 22nd 3:30PM. And, if kids consistently read for 15 minutes a day for seven weeks, they get a medal! You will likely see the mobile library over the summer at locations like the Royal City Farmers Market. And, if you borrow items and can’t make it back to the library in a timely fashion, you can make returns at various places around New West including City Hall. Of course reading is not just for summer. It’s a great winter activity too and the New West mobile Library is often on the scene at community events then, as they were at the Anvil Centre following the Santa Parade last DEC 5th. Librarians read various classic Christmas tales and I told Lucan he could select a book for the holidays, since we had his library card with us. Lucan choose “The Polar Express”. Unbeknownst to him, we were scheduled to ride that very train in Squamish the following weekend; reading the book at bedtime all week and then watching his delighted face as we were handed our golden tickets and boarded the train, is one of my life’s highlights. 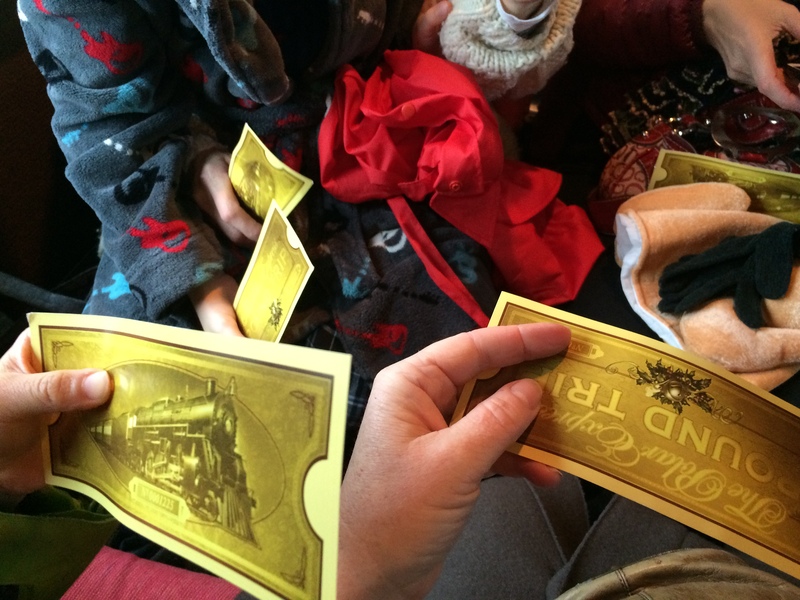 Our golden Polar Express tickets – we’re in the storybook! Stories are not meant to just entertain, although that is important, but they teach us many things about history, creation, how to build things, the animal kingdom and the interpersonal relationships of humans, to name a few. Books are not just paper and ink held together with glue. They are in fact portals to other places, time periods, sometimes other dimensions. I am certain that had I not consumed stories about exotic places and momentous points in history, peopled with amazing characters, I would not have become a traveller. Reading inspired me to explore lands, cultures, people and time. And it all began with a funny cat and a curious monkey. Well, okay, technically he’s a chimpanzee, but you know what I mean. So, welcome to the club. Whatever your choice of summer reading, and whether it’s poolside, on a beach or a grassy knoll, a deck chair or curled up on a couch, enjoy your marvellous adventure. 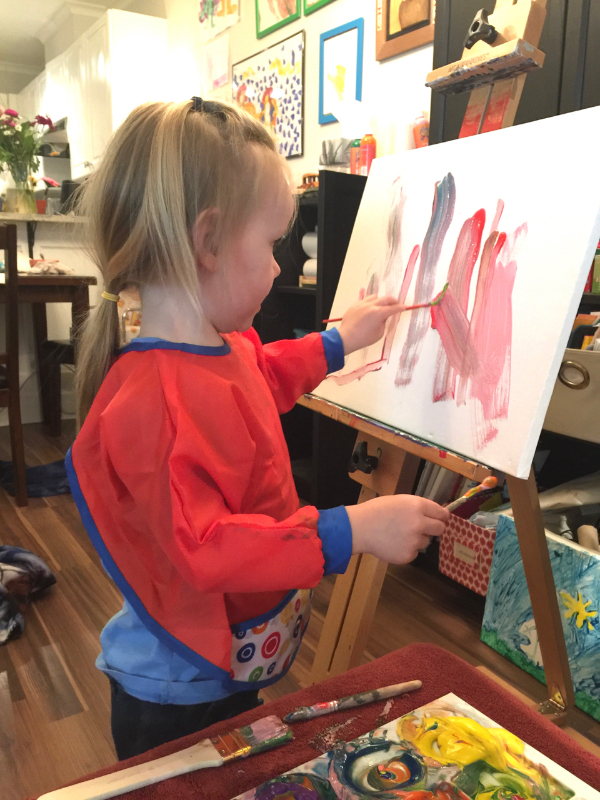 When Parenting and Art Intersect. When you’re a parent and an artist, do those roles intersect? Do they need to operate parallel to each other, or can they be entwined? This article from The Cut explores the messy reality. Traveling With Children (Don’t Do It). My 3 year-old, on the other hand, was not as enthused. He was quieter than usual the day we trekked to the Island and he finally voiced what he was thinking as we inspected our new home for the next four days: “Why are we here?” he asked. “We’re on vacation!” I enthused, with way too much joy in my voice. He could tell I was trying too hard. It’s a fair question. Why did we travel for 7 hours each way and spend almost $1,000 to spend four days on a wet beach? It seemed so idyllic when I pictured it in my mind. But as we squeezed ourselves into ridiculously thick wetsuits that cost a bundle to rent, freezing in the rain and desperately trying to pull the thick material over embarrassing body parts, Travis whimpered and moped. It was clear that he was not enjoying himself. We only ended up playing for an hour before heading back to the rented cabana. And then we sat around watching cartoons and making meals, just like we would at home, except without all the stuff that makes our home ours. And we searched every store in the town for a bottle for my pre-schooler who should be way over bottles by now but isn’t and we did not succeed at finding one. I remembered what it was like vacationing with my first son when he was a baby. Basically, it wasn’t fun. It was just getting up way too early and feeling overwhelmed in a new location. I guess I’ve been expecting that to change as the boys get older, so I just keep trying. And I continue to try. I write this from my laptop at my father’s house on a reserve in Saskatchewan. I flew here this morning on a two-hour direct flight from Vancouver. 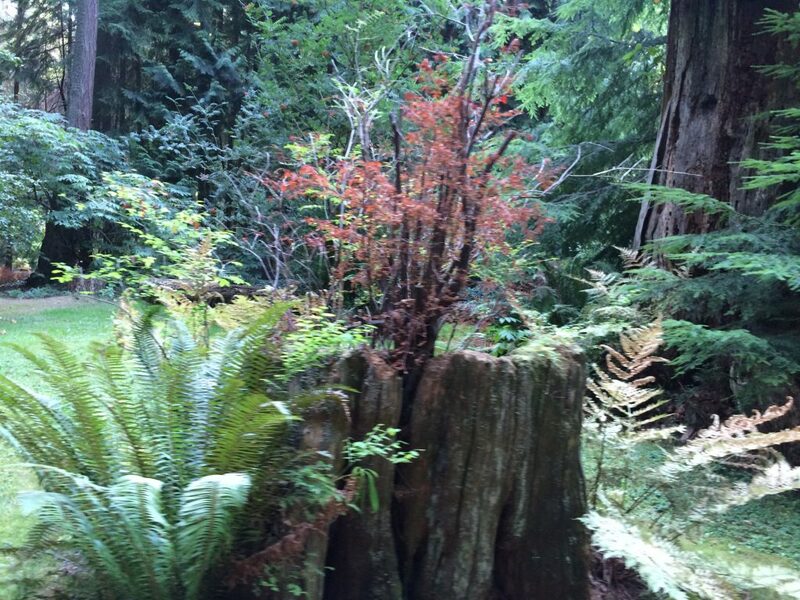 I was impressed by how quickly we went from being in Vancouver to being so far away. But Julian’s experience was not as rosy: “That was the longest, most boringest trip I’ve ever taken,” he said as the plane taxied to a stop on the runway. “Really?” I thought. “That journey would have taken your ancestors six months, you ungrateful little brat!” That’s a joke – I didn’t really think that. But it did strike me as interesting. Another case of Child Does Not Appreciate Travelling Like I Do, I guess you could call it, if you were making notes on my life and giving them strange titles. We’re already planning a trip to Mexico this winter. Parenting is funny. I had no idea what I was getting into when I chose to start a family. I knew I wanted kids, really badly, but I didn’t really know why or what to expect. It’s been a crazy ride for me, and for my ex-husband, one that has included an autism diagnosis, a mental health crisis, a separation (not yet divorced) and a whole whack of beautiful, unexpected and scary things. I’m still in the throes of it all, as my children are quite young (ages three and six), but I feel like I’m starting to make sense of it. And that is because I’m starting to make sense of myself. I remember sitting in a pediatrician’s office with my son when he was 3. He was my first child and I had very little experience with children, so I had no idea how different he was from other children. I was completely devoted to his every whim, and his intense moods and demands were wearing me out. I had gone to my regular doctor, asking for a referral for Julian because he just didn’t seem quite normal. At his recent 4th birthday party, he had retreated from everyone and stayed inside his little play tent. I had gotten him an elaborate Thomas the Train cake for his party, and as everyone sang him Happy Birthday, he wore a stoic look on his face. He looked serious and stressed and did not crack a smile. He blew out his candle. I felt fear then – there was no emotion. He was completely shut down. Something was up, but I wasn’t sure what it was. A friend of mine with a son who was autistic told me she felt something was wrong. I remember feeling helpless. My family doctor didn’t think he was autistic, but she referred me to a pediatrician to start the process of getting to the bottom of what exactly was the matter. In the pediatrician’s office, Julian played a game on my phone and refused to look up. He didn’t respond when the doctor spoke to him. I was used to this behaviour and explained that he was shy. 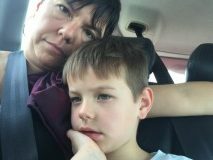 After spending five minutes with my son and I, the pediatrician gave my son a preliminary diagnosis of autism and faxed off a referral to Sunny Hill hospital for a full evaluation. He explained that for a final diagnosis of autism, a corroboration of 3 doctors was required – a pediatrician, a speech language pathologist, and a psychologist. Then he sent me on my way. I was shocked, but Julian had hardly noticed the appointment. He also hardly noticed the woman at the cupcake store speaking sweetly to him as she gave him the cupcake I bought him for enduring the appointment. But I noticed how sweet she was. And I noticed that he didn’t notice. After a little cry and some shaking, I broke the news to my family, who were mostly unmoved. I think they thought I was overreacting, which is something I’ve been accused of many times in my life. I sort of specialize in it, actually. 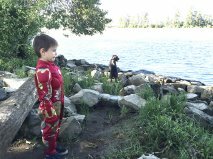 But nine months later, after all the doctors had done their thing, it was confirmed – Julian was on the Autism spectrum. I remember the long face on the psychologist as she spoke the words to me, “Your son is going to have a very difficult life.” She and the Speech Language Pathologist went on to say all the other things to my husband and I – that no two autistic kids are the same, that he could grow up to be very independent and employable, that his test scores varied wildly and that he was a unique child. Blah, blah, blah. Autism. Well, it’s only been two years since that meeting – almost to the day, as it happens – and so much has transpired in that time. I had a bit of a nervous breakdown. So did my marriage. Julian started getting treatment with a Behavioural Interventionist and an Occupational Therapist. (Why do small children on the autism spectrum need occupational therapy? I don’t know, but it is amazing. Turns out that the occupation they’re getting therapy for is mostly being a happy kid.) To my husband’s credit, he agreed with me that we should hold Julian back a year so that we could get all his therapy in place and give it a chance to work before we thrust him into the crazy new environment that is school; especially since my son’s hallmark personality traits at that time were 1)not wanting to do anything, ever and 2)not wanting to leave my side. Anxiety was a thing in our house. But here’s the thing. Things are different now. I’ve changed, and because of that, Julian’s changed too. I have taken a turn for the better and he’s benefitted. My life and his have taken on a different shape. I went through my dark night of the soul and came out shining. I’m feeling better than I have in years, and the changes have completely transformed Julian. It’s hard to fathom how different he is now. In short, I will say that he mostly functions happily in the world now. In fact, he is almost unrecognizable to the lonely, anxious, isolated little boy that I spent years dragging around to appointments. All that amazing, helpful therapy. All those sweet yet firm women who played with him and connected with him and coaxed him into their worlds. The passage of time, which allowed his brain to mature at it’s own pace. The extra time with us. My own transformation from severely depressed, anxiety-ridden mess to healthy woman, connected to herself and her community. All of these things and so many more unseen miracles. I’m grateful. So, I’m a mom to a six year-old who talks a lot, has many friends, gets invited to birthday parties, plays with the neighbour kids, stares at his iPad whenever he’s allowed, eats fairly well, sleeps normally, and is physically healthy (and drop-dead gorgeous, of course). He also hits himself in the face fairly regularly, can’t stand certain things touching him (still not band-aids! ), has bouts of anxiety, sometimes never wants to leave the house or let go of my hand, and refuses to speak to almost everyone until six months of acquaintanceship. He’s never said he loves me. And all of this is fine! It’s all totally fine. It’s fine because I’ve come to see that every child is different. Yes, like the doctors told me as they were delivering the blow that was his autism diagnosis, every child really is different. Any of you who are parents and who are reading this know what it feels like to be embarrassed by how unkind or impolite our children can be. We all know what it’s like to be concerned about how our children measure up to the norm, to other kids. We know what it’s like to worry that they won’t have any friends, that they won’t be liked. And so I’ve come to see that Julian is just like other kids after all. And I am just like like other moms. I’ve had my lows. I’ve had my highs. And I’m still here, wiping bums, making grilled cheese sandwiches and loving my children more than I ever knew was possible. I’ve come to see that mental health itself is a spectrum and we’re all on it somewhere. No one is perfect. No one is pain-free. No one is so well-adjusted that they don’t occasionally trip and fall. My healing journey of self-discovery led me to be okay with me the way and I am in turn that led to accepting Julian the way he is. He started Kindergarten this year and the other kids and parents seem to think he’s pretty much the same them. The few that I’ve told are surprised when they hear about his diagnosis. So I’ve stopped defining him in that language. It’s only a tiny part of who he is, really. He’s just a little bit autistic. It turns out that sometimes, boys have long hair! I know, I know – it’s totally crazy. A neighbour once exclaimed to me after meeting my son that she didn’t know a boy’s hair could grow that long. I guess she thought that God made boys with penises and crew cuts. It turns out, according to Google, boys have had long hair for a long time! Years, even. Heck, I’ll let you in on a secret. My ancestors have had long hair for thousands of years! Tens of thousands, even. 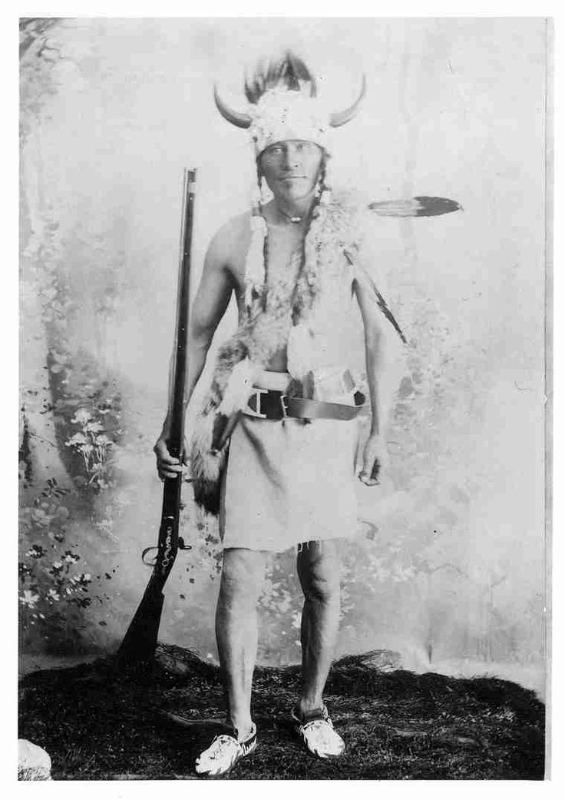 Here is a picture of my great-great-grandfather. 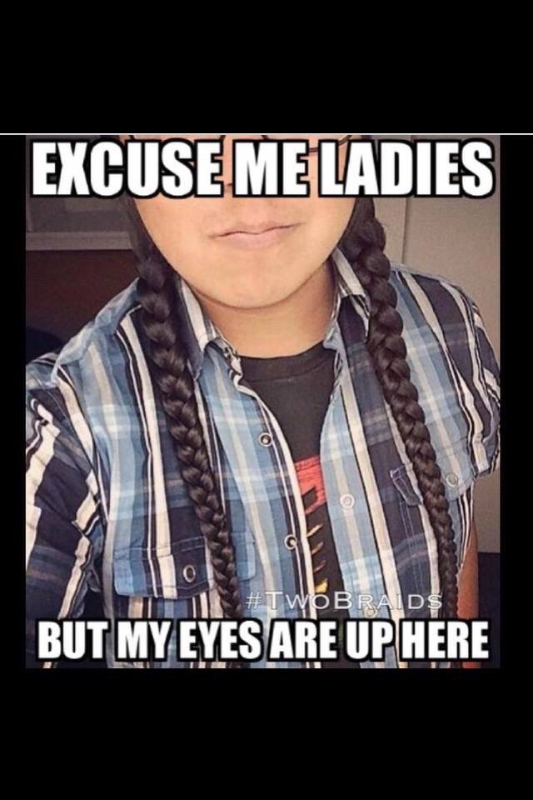 His name is Kamiokisihkwew, but you can call him Fine Day. Anyway, this is him at age 50 in 1908. Check out the hair! So now you can see how it’s possible for his descendant, my wild and rambunctious 3 year-old, to have such long hair. It’s genetic! But all hilarity aside, I will say this: it took some courage to let Travis’s hair grow long. I wanted to do it with my first son, but I was afraid of what other people would think, so I didn’t. When Travis was born, I wanted to call him River and although I didn’t quite have the courage to do that, I did decide to let his hair grow out. It’s gorgeous. Long, blonde and down his back almost to his bottom. Wow! Who knew? He loves it, too, or says he does. We brush it everyday, usually braiding it too. 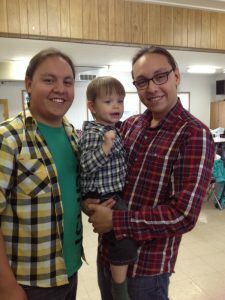 It’s just what boys do in my family – my brothers and my dad also have long hair. My oldest son with his long-haired uncles. The long-haired artist at work. Every day, people think Travis is a girl and that’s okay. We’ve mostly gotten used to it. Most people are embarrassed and gracious when I tell them he’s a boy. The other day, in the car he said, “I am a boy.” I agreed with him. Then he said, “But I look like a girl.” I said, “Some people think you look like a girl, that’s true.” When I was unbuckling him from his car seat, I said for the millionth time, “Do you want to cut your hair, honey? You could have it short like your brother’s. I can cut it, or we can go to a hair salon. We could do it today if you want.” And for the millionth time he responded, “No! I keep hair.” So he remains my beautiful boy with long blonde hair. We like it this way. Like I’m living inside a meditation tape, I hear only the soothing waves of the sea. Open my eyes and I’m still there – perched on a driftwood log, watching the tide slide out of Tasman Bay on New Zealand’s South Island. To the right, the last sliver of sun clings to the mountains we conquered a few days ago, en route from the mountain biking paradise of the Marlborough Sounds. To the left, the vast, rocky wilderness of Abel Tasman National Park – tomorrow’s quest – stretches northward into the water. Down the middle, a 75-km-wide horizon ebbs and flows at its own lazy pace into the open ocean. I’m on Kina Beach, in a perfect spot I may never see again. Before me are the ruins where briefly stood an ingenious stic k fort that our sons, aged 8 and 6, constructed as a fleeting testament to our presence. 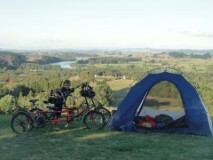 Our family tandem bicycles – one parent and one kid on each – are parked next to our tent just ten metres behind me, resting for our next expedition. We’ve claimed this space for tonight, and in the morning we’ll leave it for someone else to discover. We’re modern explorers, without the colonialism… or (thanks to Joce’s veggie obsession) the scurvy. Like Columbus and Cartier, we thrive on discovery. Every day on our bike tour across New Zealand and Australia is entirely different – an exhilarating and endless cycle of new scenery, experiences and friendships. The maps we pored over for months before this six-month family Oceania Odyssey come instantly alive with our newfound familiarity and a lifetime of memories. In New Zealand we visited Ship’s Cov e, where Captain James Cook first set a European boot on what the Maori had been calling Te Aotearoa for 500 years (since the legendary traveller Kupe actually discovered the place). Too bad Cook didn’t bring his bicycle – he could have seen much more of this remarkable land. Exploring new countries on two wheels is pure magic. 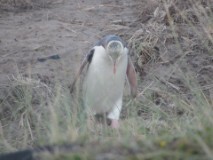 Instead of taking hundred-dollar tours to see wildlife, we glimpse it from our backroad-and-cycletrail perches: the elusive white heron spearing fish on west coast glacier rivers; endangered yellow-eyed penguins from a grass-covered hide as they emerge from their feast at sea to return to their nests; and kangaroos nibbling breakfast in the bush camp site we reached by an old fire track. Our greatest discoveries have been found through the advice of locals we meet along the way, who are intrigued by our bike set-up and strike up conversation. In a campervan we would have flown right past Nikau Caves, on a dirt road well outside Auckland, en route to the glitzier Waitomo. But a woman we met camping in Shekinah – also way off the main path – tipped us to this rugged tour (given just for us by the farmer whose land the caves are beneath) squeezing through crevices and wading knee-deep through underground lakes to the cavern lair of thousands of glow worms. One night, a month later, we stopped at Curio Bay where we heard that dolphins come close to shore on rare occasion. We arrived just before sunset (happily now at about 5pm, so the boys don’t have to stay up late to catch all the dusk-time animal viewing) and saw nothing for a half-hour. Then Sitka and Heron started dancing and singing for the dolphins to come out and play. “That’s cute,” thought Ed, not believing two bouncing boys could sumon wild sea mammals with song – until a dozen or more Hector’s dolphins popped out of nowhere, not 15 metres off the beach, and began surfing the waves as they crashed on the shore. They put on an hour-long show better than any aquarium stage, leaping and spinning about, as Heron and Sitka put on a show for them too, screeching and leaping in the air every time the dolphins surfaced. More often than not we’re the only human presence on a trail, campsite or back road – alone with the sounds of conversing tui birds or guffawing cockatoos. Maybe, we think, like our European ancestors, we should plant our family flag in these spots and name them after family members, as though the footprints under the dirt never existed. We’ve felt the exhilarating thrill of a successful expedition each afternoon when we discover our destination – and on that sunny day at Bluff when our tires reached the southernmost tip of New Zealand, 3,400km from when we left Cape Reinga at the northernmost point. Each night we look up at the stars (now appearing by 5:30pm as the southern winter approaches) outside our small nylon home, breathe deeply and wonder about who else is out there looking back at us. Tomorrow we’ll find new lands beneath our bike tires and new worlds all around us. We’ll go places we’ve never been, and see things we may never see again. Then we’ll stop for frisbee and ice cream, and leave those places for the next explorer family. Every so often, the script takes an unexpected turn – like one Sunday morning as we’re leaving a campground on New Zealand’s north coast. A rule of etiquette in New Zealand, we’ve learned, is to never say no to snappah. And so a week later, we camped out on the beautiful back lawn of Gerrard and Lorraine, two delightful souls with a magnificent view and a fishing boat. We had hot showers, fascinating conversation about Kiwi culture and politics, and at least for Ed (our designated gratitude eater who suspends his vegetarian lifestyle for generous local offerings), some killer breaded snapper. We’ve been treated to extraordinary hospitality on past travels – on the Camino de Santiago in Spain, villagers seeing our baby son in our backpack carrier would rush out from their quaint homes with freshly baked goodies; on our cycling honeymoon from Vancouver to Mexico, a sweet retiree named Cliff picked us up with a broken spoke, took us to dinner and paid for the repairs the next day. But in New Zealand it seems that proactive, grand generosity is a national ethic. Twice we met fellow cyclists on the same north-to-south route in New Zealand, who gave us their phone numbers and made us promise to come stay when we passed through their hometowns. Those visits were among the brightest highlights of our trip. These startling acts of kindness are fine examples for our sons, aged 8 and 6, of the very best of humanity. They introduce us to new people to share a splendid evening with. And on a slightly less enlightening note, they’re fantastic for our tight budget. We are also part of the amazing online cycle tourist community, Warmshowers. We’ve hosted cyclists passing through New Westminster over the years in our home, providing room, meals, laundry and local route ideas; and we visit other members when we’re on the road for the same. New Zealand is packed with Warmshowers members, so we were guests about once a week with some fascinating people and families – who are now dear new friends. It’s not just the grace of strangers that has helped us keep our Oceania Odyssey budget to a tight $100 a day (to cover everything from food and accommodation to bike repairs and adventure parks). We’re running on a combination of savings from living a low-cost lifestyle in New West (we live in a co-op and don’t own a car, opting to cycle instead) and what’s left of Jocelyn’s line of credit from med school (our trip is celebrating her graduation as a naturopathic doctor), so it’s been crucial to keep costs down, while keeping the fun maxed out. BYOT. Camping is the way to go – pricier in parts of New Zealand than we expected (charging per person instead of per site), but still much more affordable for a family of four than backpackers. When it’s cold or rainy, campgrounds have cheap-esque cabins with bunkbeds and a heater that feel like a Hilton when you’ve been tenting for weeks on end. And most have camp kitchens with stoves and fridges, saving on cookstove fuel! Camping also allows us to “self-cater” – we cook up hot suppers and breakfasts in camp, and pack up a big lunch for the ride, avoiding the expense of eating out. In Australia we’ve seen campgrounds that provide the tent for you, already set up – but they ran over $300 per night, so bringing your own is worth the added weight on the bike rack. Cycle! New Zealand and Australia are packed with campervans, which look like fun, cheap alternatives to hotels – but when you consider rental costs ($100 a day for a four-berth), insurance, paying for the space to park it (higher price than non-powered tent site), and gas (er, “petrol”), better to let your legs do the moving. Then again, sometimes as we exited grocery stores with overflowing carts, we wondered if maybe campervanners ate less than ravaged cyclists. Get kids in on the budget. Our sons know that we have $100 a day, and any time we spend less, we can save for an adventure of some kind, like mini putt or kayak rentals. So Heron and Sitka are the most conscious school-aged shoppers ever, even checking the price-per-100g on the shelf tags to be sure we’re getting the best value from our avocados, trail mix or gallon tubs of ice cream. The key to accepting hospitality is to give back. In Whangarei, we repaid our hosts by volunteering ourselves and our tandems to deliver 50 pizzas for a fundraiser at their church. In Hokitika and Wellington, we made home style pizzas for our hosts. In Wanaka, we brought beer. And we always at least endeavour to do the dishes. We’ve heard of super-guests who do art or design a garden plan for their hosts – whatever their skill is, they give back. And when in doubt, commit to yourself to pay the kindness forward. We have an awful lot of karma to pay back upon our return to New Westminster – thank goodness we now have a spare bedroom! When we stop for groceries on a family cycling tour, the whole store knows it. After biking, camping and running wild in wide open spaces for a few days, our feral boys charge through the aisles like they’ve been licking moss off rocks on a deserted island for a month, ecstatically shouting out the names of every item in sight. All those calories going out into pedalling must come back in, and they are eager participants in our family meal plan. Over the years we’ve found that if Joce does the shopping, she comes out with 30 pounds of fresh fruit and vegetables, a big bag of nuts and one box of pasta. If Ed heads in, it’s 30 pounds of pasta, potato chips and powdered donuts. So Joce ends up doing the shopping. Our big challenge is getting enough fuel for four very active pedallers to avoid bonking (running out of glycogen) before the next grocery stop (every 2-3 days), while having enough room to fit it all in our panniers, and managing to stay healthy on this epic six-month bike marathon. As our boys have gotten older, we’ve added a spare 15-litre dry bag to pack on top of our already heaping racks, knowing that the extra weight will abate as we gorge. As we teach the boys French en route, our first phrase to learn was “J’ai faim,” because they’re by far the most-heard words while pedalling (we soon added “très” and “beaucoup”). Our heaping breakfasts last only minutes on the road before Sitka starts asking about lunch. They’re not the only insatiable ones – Ed is often caught hovering over the boys’ meals wondering if they’re full yet so he can snag the leftovers. We’ve been lucky in New Zealand and Australia to regularly match our home diet of vegan / vegetarian, gluten-free, and low-glycemic options (can you tell one of us just graduated as a naturopathic doctor? ), though we’ve learned to be flexible when our rumbling bellies insist (or very generous new friends offer intriguing local delicacies). Fortunately for Ed, who tends to lose 10 pounds the minute he puts on bike shorts, and even more as he cycles, these delightful offerings happen strikingly often in New Zealand. Ed has temporarily put aside decades of vegetarianism to become our designated family gratitude eater: freshly caught snapper; home-grown ground venison; a mammoth package of fish, chips and sausages; and heaps of assorted, doughy desserts. We’ve also been treated to delicious vegetarian dishes – curries, lentil loaves and filling salads – for the whole family to enjoy. So the boys, despite their reports of constant hunger, are gaining height/weight and thriving on a steady (and substantial) diet of greens, plums, oats and gorp. Given their endless stores of energy that get them bounding about in full-on play mode even after a full day’s ride, we’ll continue letting them loose in grocery stores to help pick out the next load of cycle-family fare. Watch out, shoppers! It all began with a locked gate. Well, actually it started two weeks earlier, back in our townhouse in New Westminster. Jocelyn was in the final throes of studying for her naturopathic medical board exams – three straight days of testing on everything she’d learned in four years of medical school – and Ed had just wrapped his hectic four-year job as a writer. With one week to go before flying across the Pacific for a six-month cycling trip, it was time to make a packing list. There’s a fine balance in cycle touring between packing everything you might need for the duration of your trip, and not weighing more than a transport truck. From our tent to our pillows, our gear is the smallest, lightest possible version of a necessity while still being big / warm / comfy enough to survive weeks in a row sleeping on the ground. We even got a tiny military-issue can opener instead of lugging the behemoth we use in our kitchen. Ed, however, is still kind of a “just in case” kind of packer. On our longer trips, Ed compiles everything he thinks we need in a heap on the floor, then Joce reviews the pile and tosses about half of it out as non-essential. This time, we flew to Auckland, New Zealand, two days after Joce’s board exams. So the pile review never happened. The night before our flight, it was just Ed, his heap and the bathroom scale, allocating every last bike mirror and toothbrush to the proper duffel bag so each weighed precisely the airline limit. And hey, a frisbee doesn’t weigh much at all. 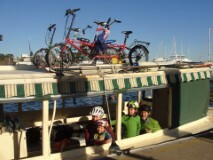 We’re also traveling with fabulous Bike Friday family tandem bicycles that are easily disassembled and folded into Samsonite hard-shell suitcases, which double as a spacious trailer system while biking. Super easy for plane travel – but on the road, more like an 18-wheel rig with pedals. 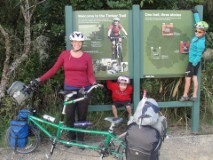 So here we were, on our second day of cycling across New Zealand, on a rugged hiking trail that was not really suited for wheeled vehicles – much less fully loaded tandems and a trailer system filled with an unreviewed heap of stuff. Standing in front of a locked gate. “No, that’ll take too long. I’ll just lift them over,” Daddy gamely volunteered. Forty-five minutes later, we’d unloaded both bikes, dismantled the trailer system, passed all the bags and loose crap in the trailers – the snorkel gear, Daddy’s razor kit, the frisbee and spare bungee cords – over the fence, and re-assembled the whole caravan on the other side of the gate. We’re all still having a great time because we’ve been listening to the boys’ favourite Hedley album on the bike radio, and at least we won’t have to do that again. Shortly thereafter, the path turned to long grass, weaving up a long, meandering hill. A few mumbled garrumps from Daddy. Our younger son, Sitka, is undeterred and sings merrily along with the Justin Bieber until we’ve all pushed the bikes to the top and less annoying terrain. Until the next locked gate. Daddy lets a swear slip and apologizes. We try lifting the bikes again, with similar results. So we unload, dismantle and re-assemble again, to the sounds of more snappy hip-hop and pop hits. The snorkel set and frisbee are thrown over the fence. Couldn’t possibly be any more of these. There are five more of these. Daddy no longer apologizes for the swears, and vocally wishes harm to the members of One Direction. We whittle our dis-and-re-assemble routine down to 18 minutes – sweet. Daddy retrieves the frisbee from the bushes. Finally, we have a downhill so steep we need to apply our extra drum brakes to keep control, and then we’re through to a sandy (but at least flat) road. Daddy checks both sets of brakes and fenders. All good. Must be the sand. Are we going uphill? “Hey Daddy is your drum brake still on from that last downhill?” asks Heron. So we pick up some speed as the sun slowly descends in the late summer sky. Just one bridge to cross and we’re almost there. The dilapidated footbridge across a 200-metre-wide river may well have predated the invention of the wheel, much less bike trailers. We don’t discover this until we’re wedged into the narrow wooden structure. Somehow, we separate the two trailer cases and wheel them separately across. Surprisingly, the snorkel set doesn’t go into the river – but our sons’ dictionary of swears is complete. It took another couple weeks of treacherous climbs with our massive load before we resolved to ditch half our stuff. It was Joce’s idea to mail the suitcases ahead to Invercargill – our destination at the far south of the country – and she would be in charge of the purge. The snorkel set didn’t make the cut. Neither did the spare bungees. Daddy’s razor went in the trash. But the frisbee stayed – weight-efficient entertainment. “Do you really need these warm socks?” Joce asked. We kept the socks. But the rest of Daddy’s warm clothes got sent ahead with 65 lbs of other surplus, including the suitcases we packed it all in. We never came across another locked gate, but we encountered several narrow bridges, steep hills and tight corners where we were relieved to be traveling on just two wheels per bike. Much grumpiness was prevented, and when we met our cargo again in Invercargill, almost three months later, Ed cuddled happily in his fleece vest. A few days later, in Sydney, Australia, the fleece got mailed ahead to Brisbane with the rest of it. Same with the snorkel gear – we’re saving that for our trip finale in French Polynesia. And Ed’s beard has gone wild.